Description of "If Only You Came A Little Early"
Love makes us do both terrible and wonderful things. It is known for inspiring people to reach the heights of greatness as well as for destroying lives and taking them down an abyss of despair. Love may strengthen us to overcome great adversities in life and sometimes love is the sole adversity that a person may be grieving from. Love is a wavy, undulating ocean of feeling and emotion that has been the topic of creative interest for ages. 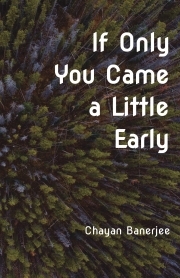 If love is a religion, then this current anthology of poems tries to define the many faces of love and the strife, the tribulations, the ecstasy and that feeling of emotional fulfillment it brings in the lives of its worshipers. Reviews of "If Only You Came A Little Early"